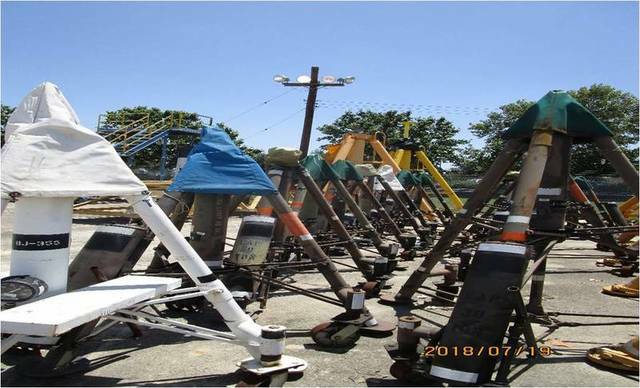 Port San Antonio surplus equipment including metal fabrication equipment from defense contractors at the port. Loading On Site: DFW Movers & Erectors will be onsite with a forklift & operator and is available for hire to load anything in the auction. For pricing information, contact Sandra Wentrcek (210)294-4010 or (210)414-5300 orSandra@dfwmovers.com. Proof of insurance for this rigger is on file with the Auctioneer. DFW moved all of the equipment in this auction to the surplus warehouse (auction site) and they are familiar with each piece. These are the Terms and Conditions of Sale for this online auction. They consist of this introduction and twenty-one numbered paragraphs that outline the relationship between you (“the Bidder”) and Jones Swenson Auction Marketing, Inc. dba Jones Swenson Auctions (“Auctioneer”). 1. This is a Public Auction. By registering to bid in this auction, you acknowledge and agree to these terms and conditions. Lots begin closing in numerical order at 9:00 AM CT on August 21, 2018 and will close one lot every minute, with extended bidding in effect. Bidders must provide a valid credit card to register to bid online. 2. Payment will be processed immediately after the last lot is sold on August 21st with the credit card buyer submitted at registration, unless buyer has made alternate payment arrangements PRIOR to the end of the auction by contacting Auctioneer at 512-261-3838 or email: info@JonesSwenson.com). If credit card does not go through and buyer cannot be reached by cell phone within one hour, Auctioneer reserves the right to resell the items to the back-up bidder without notice. At the close of the auction, buyers will receive an “unpaid” invoice. Once credit cards are run, an email confirmation & paid invoice will be emailed to buyer confirming process of payment. BRING YOUR PAID RECEIPT WITH YOU TO PICK-UP YOUR PURCHASES. Payment can be made by VISA, MC, Discover, wire transfer, Bank ACH or by cash or cashier’s check. Buyers should be available by cell phone (or other phone number provided at registration). Payment must be received by 2:00 PM CT August 22, 2018 unless you plan to pay with cash. Payment by cash must be made at the auction site on August 27th. A paid invoice will be required to remove purchases. No items may be removed until payment is made in full. 5. Removal: Monday August 27 through Wednesday August 29th from 9am-4pm CT. 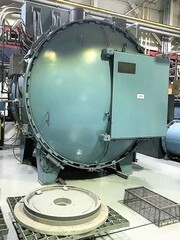 The VTLs and Vacuum Furnace may have an extra day if needed. If you cannot remove your purchases within this timeframe, do not bid. AUCTIONEER DOES NOT OFFER LOADING or SHIPPING. Bring whatever equipment and personnel that you need for removal or hire the rigger on site. Bring your paid receipt for removal. Anything remaining after removal time will be considered abandoned. The Auctioneer is not obligated to issue you a refund if you are unable to pick up and remove your items during the published removal times. 7. Loading On Site: DFW Movers & Erectors will be onsite with a forklift & operator and is available for hire to load anything in the auction. For pricing information, contact Sandra Wentrcek (210)294-4010 or (210)414-5300 or Sandra@dfwmovers.com. Proof of insurance for this rigger is on file with the Auctioneer. DFW moved all of the equipment in this auction to the surplus warehouse (auction site) and they are familiar with each piece. 8. Contract Riggers / Movers: If buyer wishes to hire or contract with a machinery mover, rigger or other type of outside contractor, Auctioneer will not allow them to work on these sale premises unless they have placed with the Auctioneer PROPER INSURANCE protecting Jones Swenson Auction Marketing, Inc and Port San Antonio,against any or all claims arising from personal injury and/or property damage created by their actions. This requirement is for the Seller’s and Auctioneer’s protection – NOT FOR BUYER’S, therefore the Auctioneer suggest that the buyer review the insurance policies of the machinery mover regarding the coverage that they have, protecting the purchaser and damage or loss of the equipment they may be moving for the buyer. Any buyer who brings their own motorized or powered equipment on the premises to dismantle or remove equipment, must provide the Auctioneer with PROPER INSURANCE as stated above. 9. Everything is sold “As-Is”: All items in the auction are being sold, “as is, where is” without warranties or guarantees of any type and with all faults. AUCTIONEER AND SELLER EXPRESSLY DISCLAIM AND EXCLUDE THE IMPLIED WARRANTIES OF MERCHANTABILITY AND FITNESS FOR A PARTICULAR PURPOSE. Bidders should rely solely on their own inspection of all items prior to the sale and should satisfy themselves as to the usefulness and value of each item. Any statement in the description regarding the items to be sold should be considered a limited guide only. Any error in description does not relieve the buyer or his/her agent of their responsibilities to inspect. There are NO REFUNDS OR RETURNS. 10. Bidder’s Duty to Inspect and Investigate: You acknowledge that the Auctioneer is providing you with the opportunity to inspect the items being offered for sale in this auction. The Auctioneer strongly encourages you to attend the scheduled inspection for this auction, which will take place on the date listed above. If you choose not to attend the scheduled inspection or are in doubt about the condition, completeness, or suitability of a given item, please bid accordingly. 11. Choose Wisely: We want everyone to get a good deal and most will. However, when you bid on the wrong item or decide an item is not suited for your intended use, our sellers will not assume the cost of your mistakes. You agree that your failure to inspect or otherwise become fully informed about the items offered for sale in this auction will not be grounds for a refusal to pay amounts due, nor for any claim against the Auctioneer. 12. Buyer is Responsible: Seller, Auctioneer and Buyer expressly agree that Buyer is responsible for and agrees to indemnify Seller, Auctioneer and their respective affiliates for any and all damages (whether based on contract, tort, warranty, negligence, strict liability or any other legal theory, and including special, incidental and consequential damages), losses, expenses, attorneys’ fees, court costs, etc., that arise out of or result from the removal, possession or use of any items purchased at this auction, or any other claim regarding the use or possession of any asset purchased at this auction. 13. Chargebacks Prohibited: Buyer agrees that they will accept all charges placed on the credit card associated with your account, and you agree that you will not charge back any amount that the Auctioneer charges to your credit card. You agree that this provision applies equally to amounts charged in connection with any items you have won and any buyer’s premium or sales tax applicable. 14. Default and Resale:  You agree that if, after being declared the winning bidder, you fail to pay for any item that you have won for any reason, your account will be declared in default. If you still fail to pay for any item after being notified of your account’s being in default, you agree that the Auctioneer will have the right to immediately resell your item, and you further agree to pay (a) any cost associated with the resale and (b) any deficiency between your original purchase price and the resale price. 15. Disposal of Unclaimed Items:  In the event you refuse to pay for or abandon any item that you win at auction, the Auctioneer will have the option of reselling, removing, storing, or disposing of the unpaid-for or abandoned item. You understand and agree that you will be personally responsible for all deficiencies – and all legal, collection, transportation, and storage expenses – associated with your delinquent account and/or abandoned items. In the event of resale, you agree to pay any cost associated with the resale as well as any deficiency between your original purchase price and the resale price. 16. Suspension of Bidding Privileges: You understand and agree that any violation of these Terms and Conditions — and/or any unsafe or illegal activity during any auction-related event — may result in the Auctioneer’s suspending your online bidding privileges indefinitely. Nothing in this paragraph will limit the Auctioneer’s right to any other remedies at law or in equity. 17. Internet Problems: Auctioneer and Seller are not responsible for any internet connection problems that may occur during the auction. Bidders should understand that sometimes internet connection or delay problems do occur. Auction lots will not be re-sold or brought back up for bidding because of internet problems. If you have issues with placing bids, please contact HiBid Customer Service directly (352) 414-1947. 18. Missing Items: In the event an item sold in the auction is found missing prior to removal, the Auctioneer/Seller will only be responsible for the refund of the purchase price, buyer’s premium and any sales tax. Buyer agrees that the only compensation due them will be the refund of actual money paid. 19. Claims and Choice of Venue:  Any claim or controversy arising out of or relating to these Terms and Conditions, or to any breach thereof, will be resolved exclusively by a state court having jurisdiction in Travis County, Texas, or in the Federal District Court for the Western District of Texas, where federal jurisdiction exists. Each party hereby submits to the jurisdiction and venue of such courts. You agree that all claims instituted by you will be litigated on an individual basis, and will not be consolidated with any claim made by another party. You agree that any judgments awarded may be applied to and collected from you personally or corporately. Should you file an action contrary to this paragraph, the defending parties may recover reasonable legal fees and costs. Further, if you bring a claim against the Auctioneer and do not prevail, and/or if the Auctioneer takes action against you as a result of your violation of these terms and conditions and is the prevailing party, you agree that you will reimburse the Auctioneer for all reasonable legal fees and costs including reasonable attorney’s fees. 20. Governing Law & Venue:  These Terms and Conditions will be governed by and construed under the laws of the State of Texas. 21. Entire Agreement:  These Terms and Conditions contain our entire agreement and supersede any prior oral or written agreements relating to the same subject matter.